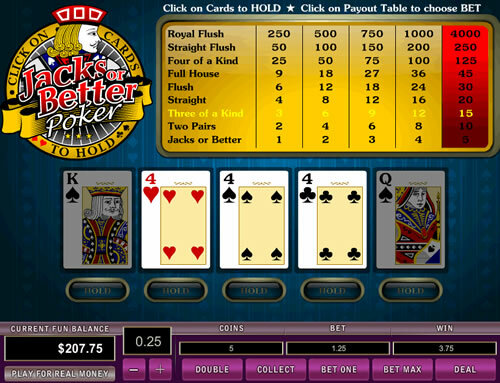 Jacks or Better is almost a classical video poker game if not for the twist of the game’s unique hand. You will not collect winnings with just any pair in your hand; it needs to be at least Jacks or better, meaning Queens, Kings or Aces. This is a very quick paced and fun poker game offering you a chance at gambling any winning hand. 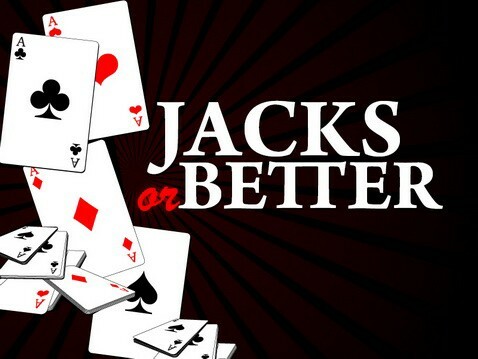 Jack or Better follows the conventional poker hands except for the hand that has given the game its name. You need to have at least a pair of Jacks or higher to win, this means a pair of anything less than a Jack means nothing in this game. You choose your bet level ranging from 1 to 5 and also can pick the coin value, which ranges from $0.05 to $10.00, allowing you to control your wagers depending on how it’s going for you on that particular day. Once you have placed your bet and your hand has been dealt you choose which cards to Hold. The Hold sign will mark the cards you are holding. You then Draw the next hand. Your winnings are calculated on the basis of your final hand. If you have won money on a hand played you can choose to either collect your winning or gamble it further to earn more. If you choose to gamble press the Gamble button and the game takes you to a new screen. Here you can either bet that the next card will be red or black or even try to guess the suit of the card. The game saves the 5 cards that have gone previously; still it is hard to calculate as a new deck is used for every new card drawn. The gambling game is just that – pure luck. Choose to play multi-hand variations of Jacks or Better here. The game is available in single, 5, 10, 25, 50 and 100 hand versions. 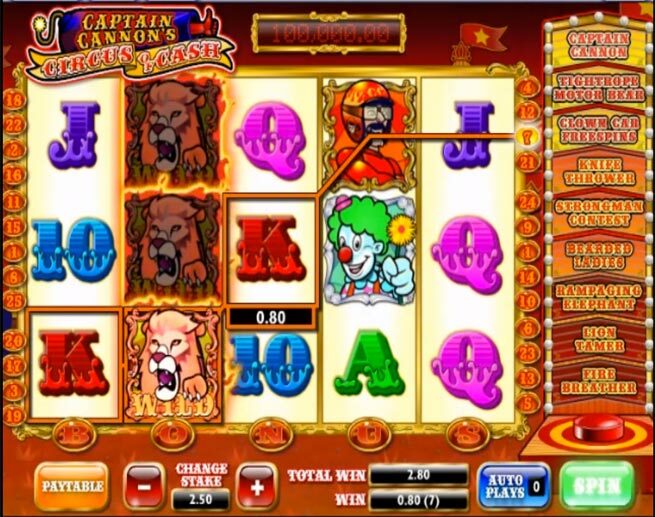 Captain Cannon’s Circus of Cash is an Ash Gaming slot with 5 reels and 25 paylines which has a Circus theme. This video slot has 9 bonus rounds (yes 9) and a progressive jackpot element. It also offers a 5,000 coin jackpot which means you can win up to 500 times your stake if you get 5 Captain Cannon symbols. The game is playable from 25p to £250 a spin. There are 9 bonus features which can be triggered in the following way – there are 5 lights at the bottom of the reels (they are labelled B, O, N, U and S). On every spin (not free spins) a random number of these lights will light up. If all 5 light up, you will trigger the bonus selection hammer which is carried out by a strongman. Fire Breather You will see fire breather move randomly along the bottom of the reels. He will then stop and blow fames up over a reel turning the reel into Wild symbols. He could turn up to 3 reels all Wild (Flaming Wilds). Lion Tamer You will see the lion tamer appear from the side of the reels and crack her whip. She will then whip a symbol on the reels and turn it wild. She can turn up to 5 symbols into Wilds. Rampaging Elephant You will see an elephant rampaging into the reels one by one and knocking out some of the symbols. The remaining symbols will drop the bottom of the reels which new symbols dropping down. These new symbols contain more wilds than normal. Shave the Bearded Lady Upon the caravan curtain being opened, you will see 2 mysterious bearded ladies. One of them is a beauty, one is not. You have to choose one (50/50 chance). The one you choose will be shaved to show if they are the beauty or not. If you guess correctly, you will win between 8-50x your bet. Strongman Contest Upon the caravan curtain being opened, you will see 3 strongmen flexing and waiting to lift their weights. You need to pick 1 of them – then they will start to lift their weights. As the chosen strongman lifts his weight, a prize will appear above his head and start counting up. The longer he keeps the weight up, the bigger your prize. Picking the right strongman is key as their strength varies. Knife Thrower Upon the caravan curtain being opened, you will see an assistant surrounded by balloons. These balloons are hiding cash amounts or extra throws. You have 5 throws initially and you need to click on the balloon to select it for the knife thrower. Here you can win between 5-100x your bet. Clown Car Freespins A small clown car will drive up into the circus area and then screeches to a halt. This is full of clowns and then they get out of the car one by one each with a balloon. Pink balloons contain free spins & green balloons contain multipliers. The values are then added together. This bonus round has a progressive element – if a gold clown comes out of the car, then you will win the jackpot. You can get up to 25 free spins with a 6x multiplier! Tightrope Motorbear You will see a daredevil bear about to ride a motorbike across a tightrope. The further along the rope he goes, the bigger your prize. Every time you press go, the bear will rev the bike and move between 1 and 6 places. The rev counter will break and then the bear stops. You will then be awarded the prize that he reaches. If you reach the end with the bear, you will be joined by a clown on his return journey – this will give you higher prizes (between 10-1000x). It also has a progressive jackpot – if a golden clown is dangling from 1 of the cash bags you will trigger the jackpot. Captain Cannon’s Wild Ride You will see Captain Cannon climb into a cannon and then get fired and collide with objects along the way. Each object collided with will award a prize and either speed or slow him down. He will also get prizes for flying through rings. If he collides into a water barrel though, he will come to a complete stop and end the bonus round. Watch out for the cash bags as these contain the big prizes (20-1000x). Again, it features a progressive element which you can trigger if Captain Cannon flies past a golden clown swinging from a balloon. Beach Life is one of the most popular and famous slot machines in the entire online casino industry. This might seem strange at first, since the graphics and bonus rounds contained within the game aren’t anything to write home about. However, there’s really just one reason that Beach Life has gained such a following: The incredible progressive jackpot attached to the game, which could potentially award you one of the largest prizes in the gambling world. 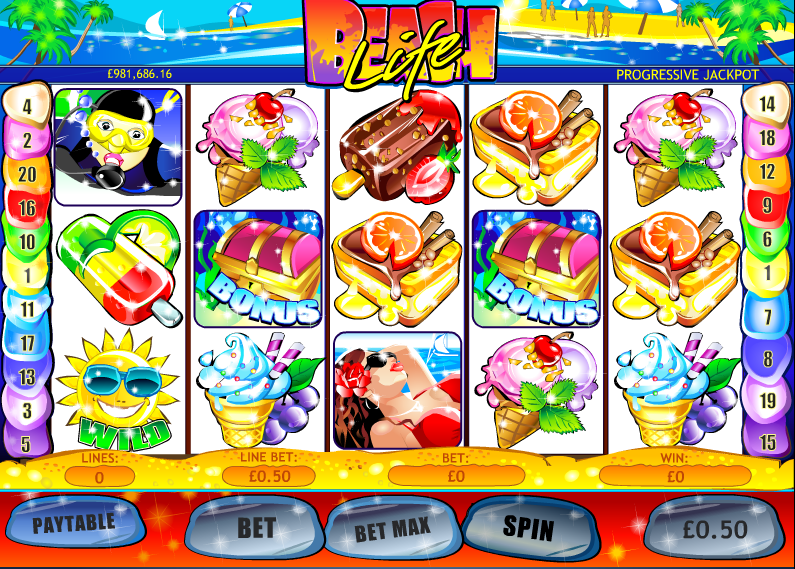 Beach Life is a 20-line, five reel slot machine that is available at most Playtech casino sites. As with some other jackpot games, players do not have control over the amount they bet per line; while this amount does vary depend on the currency you’re playing in (and has changed over time), we’ll speak in terms of dollars throughout this article, and use $0.50 as the standard line bet. This means players can wager as much as $10 per spin if they wish to do so. In Beach Life, the goal is to match like symbols from left to right consecutively across the active paylines. Players win prizes by making matches, with the type and number of symbols match determining the size of each prize. The lowest value symbols are based on food items – popsicles, ice cream, and other popular summer treats. Higher value symbols include a surfer, a sunbathing woman, and a snorkeler, who provides the largest “normal” prizes on the reels. But Beach Life isn’t really about the typical slot machine wins you’ll hit by matching standard symbols on the reels. Instead, the goal is really to hit the special symbols that contain much larger prizes (which is what makes Beach Life one of the most popular online slots). The first of these is a scatter symbol, represented on this machine by a sandcastle. Should you hit two or more of the sandcastles anywhere on the reels, you’ll win a prize that’s a multiple of the amount you’ve wagered on that spin. If you hit five sandcastles, you can win a total of 500 times your original bet – up to $5,000 total. Another important symbol is the sun. The sun substitutes for any of the regular symbols (but not the scatter symbol or the bonus symbol, which we’ll talk about more in a moment), completing winning combinations on active paylines. However, the sun symbol can also win huge prizes on its own if you can match more than one on the same line. In fact, hitting five suns makes you eligible for the most valuable prize of all in Beach Life: the progressive jackpot. Finally, there’s also a bonus symbol (a treasure chest) that can activate a bonus round. We’ll talk more about the bonus game below. Beach Life has a theme based around – you guessed it – the beach. All of the symbols are designed after things you might do on the beach in the summer: eating ice cream, surfing, sunbathing, and so on. As a whole, the graphics are fairly basic, but they are bright and have a certain intensity to them; they’re very stylish, presenting the icons in a flashy manner rather than a more “realistic” drawing style. The colors are all bright and bold, which is refreshing if you find yourself playing this game somewhere cold, longing for the days of summer. Here’s where things get really exciting. Of course, Beach Life has some fairly high normal payouts; you can win up to 500 coins ($250) for five snorkelers, or 500 times your total bet by hitting five of the sandcastle scatter symbols anywhere on the reels. But the real prize is attached to the wild sun symbol. This symbol not only acts as a substitute, but can win prizes on its own – up to an incredible 100,000 coins ($50,000) if you should hit five on the same payline. And that’s still not the largest prize in this game! If you should play the full 20 paylines, and hit five of the wild sun symbols on the 20th payline, you’ll win the Beach Life progressive jackpot. This jackpot is among the biggest prizes you’ll find anywhere in a casino, live or online. At the time of this writing, the jackpot has yet to be won, and currently has value of over $6.5 million! 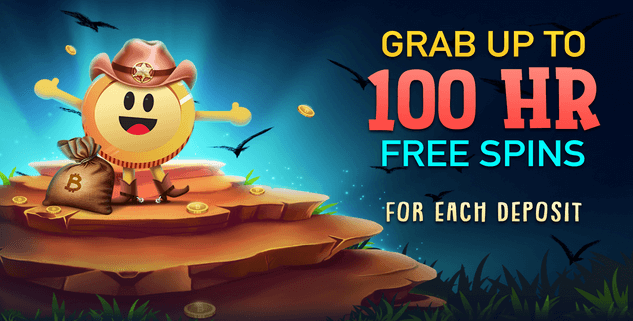 While the jackpot is going to be the feature most players are most concerned with, there is also a bonus round that can be activated by hitting three or more Bonus treasure chests on the same active payline. In this game, you’ll be moved to a second screen to play a Sunken Treasure bonus round. Essentially, this is a pretty standard “click one” game, where you’ll pick a treasure chest and reveal a prize amount. The prizes awarded during the bonus round are fairly generous, though, especially if you’re playing for the maximum number of lines available. Full of features, high payouts, exciting graphics and a progressive jackpot makes The Incredible Hulk a near perfect mobile slot. Nearly. You know what we love most about the Playtech mobile slots? You can’t tell the difference between the mobile slot and the online slot. 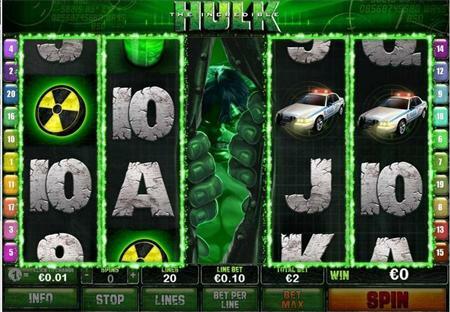 The Incredible Hulk slot on mobile plays practically exactly the same as it’s online big brother, with the same astounding graphics and eye popping features that have made the Marvel series so popular worldwide. With a starting bet of £/$/€25 a spin, this won’t be for everyone. This is easily one of the best mobile slots we’ve seen, only put on par with the likes of Thunderstruck and Starburst – but without the high risk of the first or the smaller payouts of the latter. Expanded Wild on Reel 3: Get the Hulk on the center of reel three and he will smash his way out of your screen, expanding the whole reel and giving you two free re-spins. This is one of the features you’ll see more often than you suspected, and be glad for it when it comes. Expanded Wild on Reel 2, 3 & 4: Almost as elusive as the jackpot, this feature can really hit big when it comes. You need to get the Wild Hulk symbol on reel 2, 3 & 4 at the same time, and they will expand, giving you one free re-spin of reel 1 and 5. If you get the right symbols, this feature has the potential for life changing wins. However, don’t count it, see it as an incredibly bonus if it comes to you. This feature might not come hard and fast, but often enough in your game play to top up your bank roll. 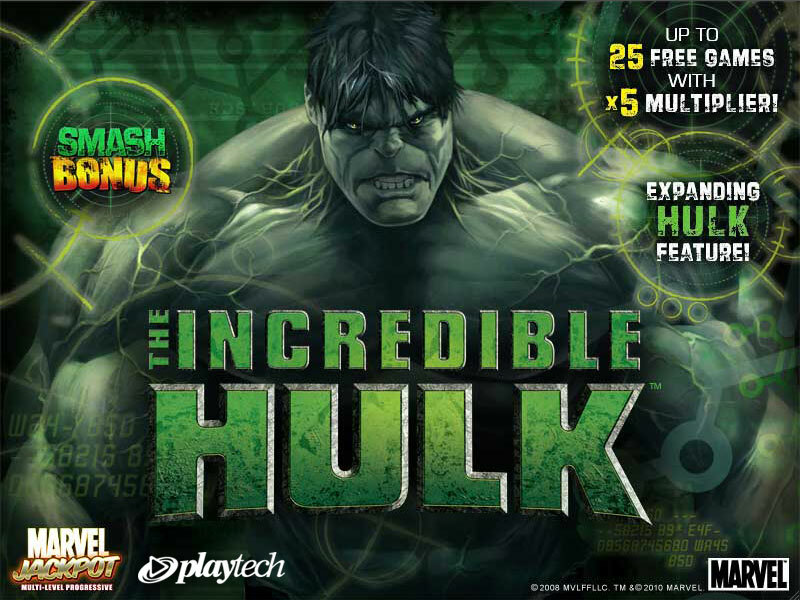 These can be re-triggered and the Hulk Expanded wild bonus can show up in the free spins with the 3x multiplier. We’ve yet to encounter it, but we know we will keep chasing that dragon for the day that happens. Smash Bonus: Difficult but not impossible to hit. Get the Smash Bonus symbol on reel 1 and 5 at the same time and the Hulk will come in all his video glory to smash three cars of your choice. If you are really lucky, you’ll randomly trigger the Hulk Rage Feature where the green radioactive monster will smash all 7 cars at once, giving you the maximum wins. Add to that the wanton destruction of one of three army helicopters who will give you a 2x, 3x or 5x multiplier, and you usually walk away from this bonus with a tidy sum. Marvel Multi-Level Jackpot: All Marvel slots are linked to four mystery progressive jackpots: Power, Extra power, Super Power and Ultimate Power. And you know what you have to do to win them? Whatever you want. No rules, no minimum bet or maximum amount of lines to win, these are won completely and absolutely randomly. That said, the higher the bet, the higher your chances of entering the jackpot game, where you’ll 100% win one of the four jackpots on offer. 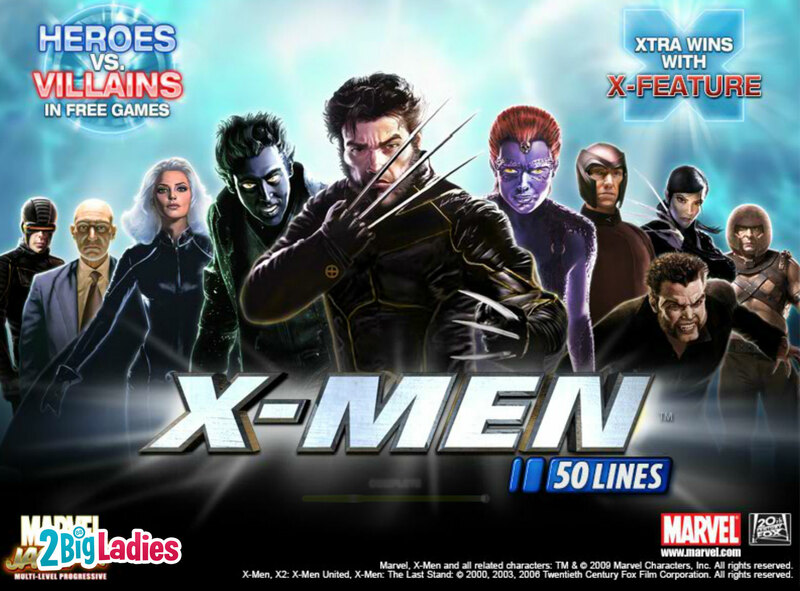 Marvel Multi-Level Jackpot game: We are afraid that we are going to have to admit that we’ve never hit this feature, so our description is purely based on what Playtech tell us on the paytable. Once you’ve hit the progressive jackpot you’ll see a grid of 4×5 squares (we suspect the reels of the game) and you’ll click on the squares to reveal the jackpot symbols. You need to match 3 symbols to win a jackpot, and you are always going to win one of the four. Many players will complain that the betting limit is too high to make this slot really welcoming to slotters. But if you are willing to play the limit, this slot easily has it all. Good payout? Yes. Awesome graphics, sounds and bonus features? Absolutely. All the excitement of decent wins throughout the base game with the potential for HUGE wins in the harder to hit features and a progressive jackpot? Yes, yes, yes and oh yes. Part of us always knew that the Hulk was one of our favourite Marvel characters – but the movies never really did him justice. It seems that he has found his place in the slot world and smashed his way straight into our hearts. Boasting ‘Infinite Free Spins’ and three progressive jackpots, this Deal or No Deal mobile slot is as catchy as it’s TV Game Show origins. In case you haven’t heard of the TV Game Show now so popular worldwide, the concept is pretty simple and ingenious. I say ingenious because it’s essentially gambling on television – so you can see why it makes a perfect theme for a mobile slot machine. You have 26 identical boxes with the sums of 0.01 to 250,000 inside of them. The contestants compete with the ‘Banker’ to deal (or not deal) over different sums of money as the boxes are open. Why do you need to know this? Because the bonus features will make a lot more sense if you do. 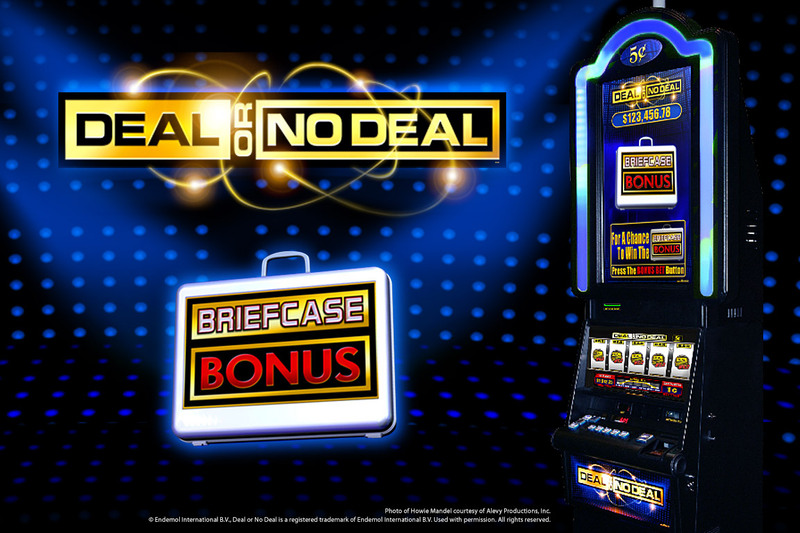 If you don’t… well this Deal or No Deal slot has plenty of winning riches to keep you entertained, even if the theme eludes you at first. We have to admit that when we first opened the game, our first impressions were pretty underwhelming in terms of graphics and sounds. But stick with it. However, before we go into the reasons of why we loved this mobile game, we would like to make a quick apology. If we got you all excited about the ‘Unlimited Free Spins‘, then it’s only because we got just as enthusiastic, before we found that this was more of an oversell. When they say ‘unlimited’ they mean ‘any number between 5 and 15 free spins’. Theoretically it could be unlimited, but after 30 minutes of playing, we never got more than 15, and rarely more than 10. Still, the payout is fairly decent for a free spins round. So why did we rate it so high? Because The Banker’s Riches has not one, but three progressive jackpots, three bonus features, medium volatility and fun game play. To be in with a chance to get one of the jackpots, you don’t have to get five symbols, as expected, but you actually have to go through the Jackpot Bonus round, which mimics the game show. Which Deal or No Deal jackpot prize you have a chance of winning is dependent on your betting range and the bankers offer on the table. The chances are not huge, but when are they with any jackpot? The Banker’s Best offer feature follows a similar and pretty exciting theme, but hits far more often, keeping the game moving. Wilds: The Deal or No Deal neon sign is the wild symbol and substitutes all symbols except the black phone scatter. The Jackpot Bonus: 3+ scatter symbols can trigger the jackpot bonus. You’ll be presented with 26 boxes that you’ll have to pick at random. The banker will make you an offer five times. It’s up to you to take the offer, or keep opening boxes in the hopes of getting the grand prize. Top prize for this features is one of the three progressive jackpots, but it’s no guarantee that it will show or is even in this game. ie. Your chances of winning one of the jackpots is not 1 in 26. So if you see a good Banker offer, it might be worth your while. Free Spins Bonus: 3 or 4 scatter symbols can trigger the Reel Banker Bonus. This is the where the ‘unlimited free spins’ round comes in. Essentially, the free games will never end until the Banker’s figure appears on reel 3. Despite overselling the ‘unlimited’ part, this features is triggered enough to be worthwhile. The Bankers Best Offer Bonus: 3 or 4 scatter symbols can trigger this bonus round. The banker will give you 10 offers consequently. It’s up to you to choose an offer that tempts you. If you don’t pick an offer, you’ll get whatever the Banker gives you on his 10th offer. 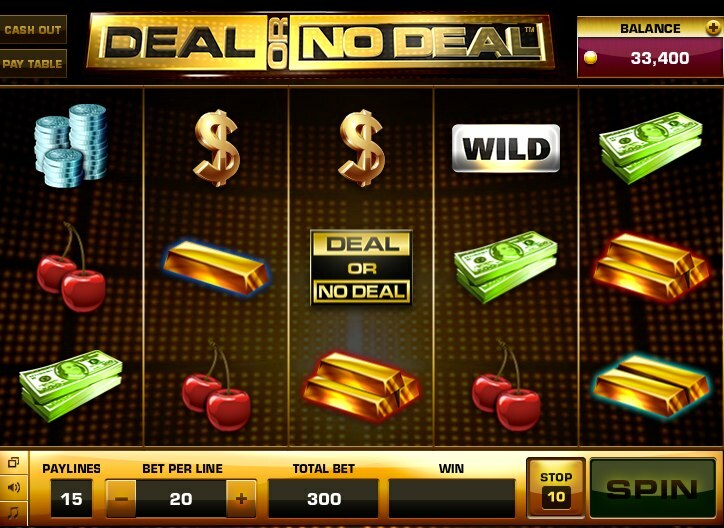 Progressive jackpots, free spins, inventive bonus games and a great betting range to suit all players, Deal or No Deal mobile slot is a winner in our books. If you don’t understand the theme it might put you off due to it’s ‘unglamorous’ or ‘un-inventive’ setting, but it shouldn’t. Whether you know the original UK based show or not, the concept is quickly grasped and the bonus features are original enough to make you feel like a real contestant at the show. Players who enjoyed the original Iron Man slot from Playtech will definitely benefit from playing the sequel, Iron Man 2. This game is packed with adventure and great features that can award amazing payouts. 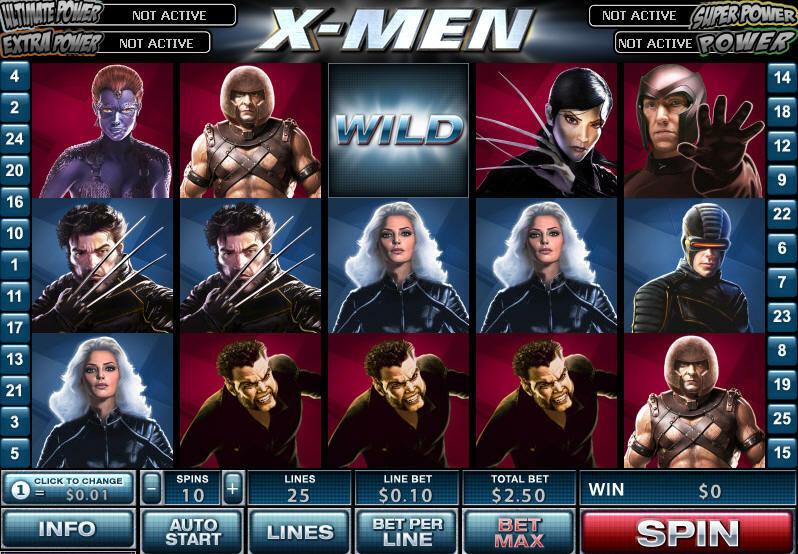 With random jackpot offerings, the winning potential on this Marvel Comic slot is spectacular. Featuring 25 paylines on five reels, Iron Man 2 is a hit in many Playtech casinos that feature the Marvel Comic slot series. This game offers many chances at winning and players from around the world have been enjoying the added features that were not available in the original version of the game. With stunning graphics and awesome sound effects, this game will definitely enhance any online gambling experience. The highlight of this game is the four random progressive jackpots that can be won. What makes these winnings different from other slot games is the fact that there is no minimum bet that has to be placed to be eligible for a jackpot win. In addition to the progressive wins, players can enjoy a top fixed jackpot that can award up to $30,000. This game offers the ability to select various coin sizes, ranging from $0.01 to $1 per payline. Players should always cover all paylines to have the best chances at winning. With a maximum of 10 coins on each line, the maximum bet for a spin on Iron Man 2 is $250, which is pretty attractive to high rollers. 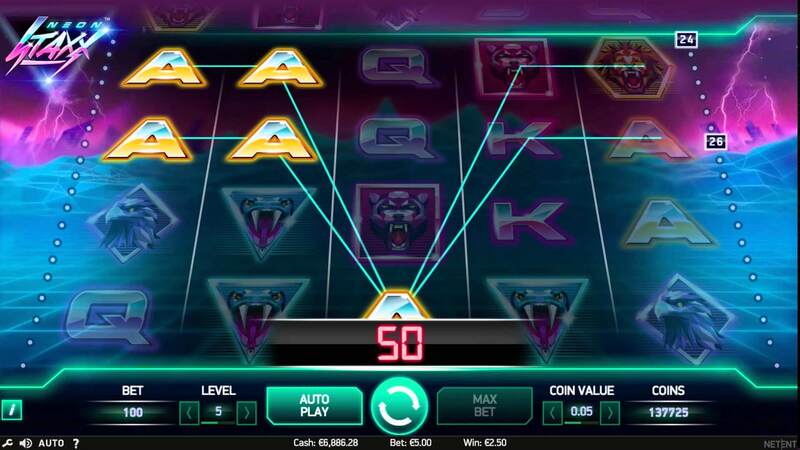 The game is often played as a penny machine and with an affordable wager, many new players will enjoy the excitement of playing for a huge jackpot reward. 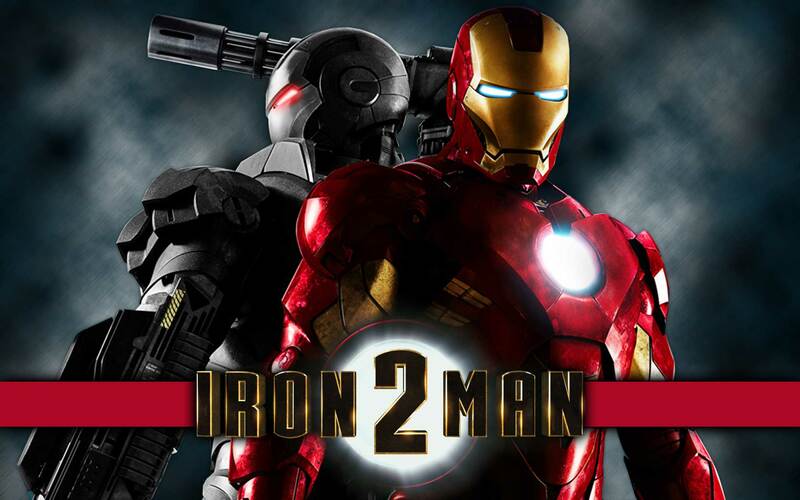 Iron Man 2 features a wild and scatter symbol as well as a free spin bonus round that offers increasing multipliers. To trigger the free spin round, players will have to get three or more scatter symbols on the reels. The scatter is the Iron Man 2 logo and this can appear in any position. During the free spin round, players will win 10 free spins and the multiplier will increase after every 2 spins. 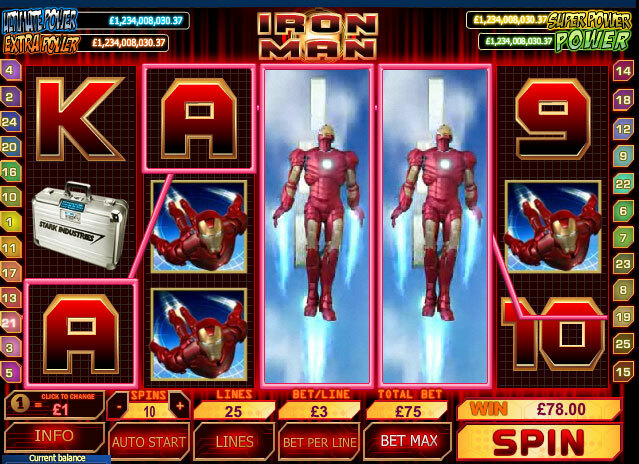 Iron Man 2 is one of the most popular Marvel Comic slots available and attracts a slew of players daily. 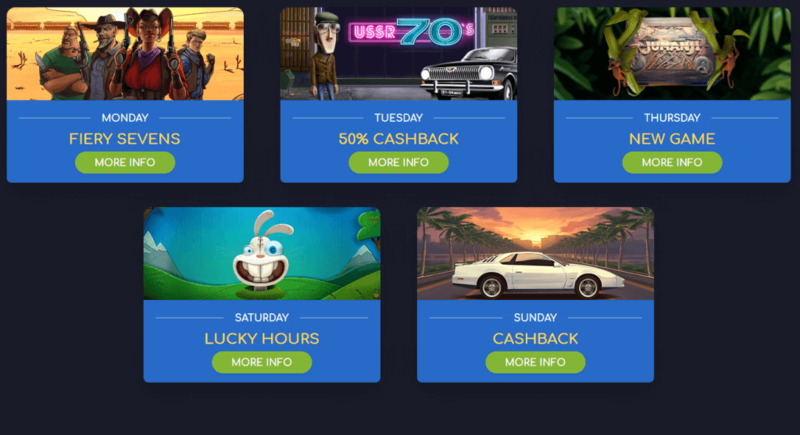 With so many great payouts and bonus offerings, the game is at the top of the list for players who are looking for ongoing slot action and amazing cash rewards. It’s not often that an online slot machine can actually make a big impression on the online casino world. Since there are numerous different casino software providers out there, each of which are producing new games every month, games tend to get lost in the shuffle pretty often. When a game does manage to grab everyone’s attention, you know it must be a big deal. Such was the case with the new Lord of the Rings progressive slot machine, which was recently released to Microgaming casinos. This game has captured the attention of the entire industry, combining great gameplay with amazing visuals and sound – not to mention of the biggest jackpots in the online gambling world! The instant you load the Lord of the Rings slot machine, you’ll know that you’re in for an experience like nothing you’ve played before. Rather than having a static background behind the reels, you’ll see a constantly changing video background that depicts some of the amazing scenery of Middle Earth (which, as you may know, is a combination of some of the beautiful landscapes of New Zealand and a little CGI wizardry). You’ll see the Fellowship of the Ring marching their way towards Mordor, as some of the classic music from the movie series plays (along with some original – but still thematic – music). The combined effect is to immediately give the game an epic feel, as the diverse backgrounds really give the game an open feel that’s very different from any other slot you’ve ever played. The interface is also perfectly designed for a Lord of the Rings game, with authentic fonts and design from the movies, which really shows that the designers of the game were making a concerted effort to produce a game that fans of the series would love. If you’re anything like me, that’s enough to get you excited to play this game already – and we haven’t even talked about the gameplay yet! The slot itself is a five-reel slot with three lines of symbols on the screen at any one time. The payout system is similar to that of RTG’s “All Pays” slots; you don’t have to worry about choosing what lines to play, because the machine automatically allows you to play every single possible line for one set price! This means that, no matter what stakes you choose to play the game for, you’ll essentially have 243 paylines – any combination of symbols from one reel to the next works, and there’s nothing particularly special about the center payline or any other combination. As you might expect, the game is based around the popular characters from the Lord of the Rings franchise – the movies, to be specific. You’ll see all your favorite characters, depicted by the actors who were in the films. Frodo, Aragorn, Saruman, Legolas, Elrond, Arwyn and virtually every other character from the series is depicted on the reels as a valuable symbol. Lower value symbols are the classic “poker ranks” ranging from tens to aces, though even these have little authentic touches like helms and swords attached to them. In addition, Lord of the Rings logos work as wild symbols, combining with other symbols to give you even larger wins. One of the coolest things about this game – at least in terms of presentation – are the video clips you get when you win by matching three or more of a single character. When this occurs, you get a clip of that character directly from the movie. We’re not talking about just a second or two to deliver a quick line, either; some of these scenes are relatively long, lasting up to 20 seconds or more! This is an awesome feature that’s not only fun, but helps slow down the pacing after a big win, which is a great way to let the player soak in the fact that they’ve just made some serious cash. There are three main special features in Lord of the Rings. The first is the free spins game, which occurs whenever you hit three or more rings anywhere on the reels. This results in a variable number of free spins, which begin with a 2x multiplier (though this is sometimes randomly increased during play). It’s nothing you haven’t seen on a slot machine before, but it’s a nice touch. The second feature is Gollum. Everyone’s favorite little creature with an obsession for The One Ring, Gollum can literally show up anywhere, at any time, to cause havoc on the reels. Luckily for you, his mischief works to your advantage, giving you all sorts of extra goodies during play. He might decide to pull on a reel to give you an entire reel worth of wild symbols. Another time, he might increase your wins multiplier during the free spins game. Occasionally, he’ll just want to show off by dumping some free money into your winnings at random! Finally, here’s the big one: the progressive jackpot. 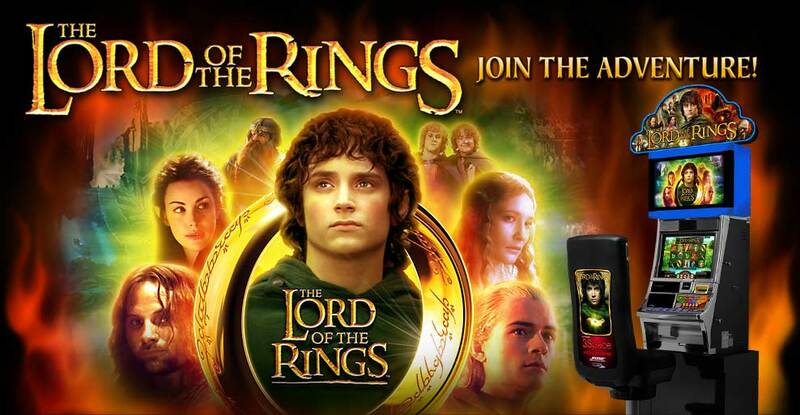 The Lord of the Rings slot is now tied into the Mega Moolah jackpot, meaning that the progressive jackpot is now often worth several million dollars (or Euros, or pounds). This randomly triggered jackpot is called the “Mithril” jackpot in Lord of the Rings, taking the name from the fantastically valuable metal in the series. Of course, there are also three smaller jackpots as well, labeled gold, silver and bronze respectively. Any of these jackpots can be hit at any time; of course, the lower value “jackpots” are hit far more often than the mithril prize. This entire article has praised The Lord of the Rings slot machine for its revolutionary graphics and video. Is there anything to dislike about the game? Well, not exactly, but there are some areas where you might be disappointed. While the game looks and feels amazing at first, the truth is that the gameplay itself is pretty run of the mill. There isn’t much interaction between you and the game, making it a pretty standard video slot in terms of gameplay. But that’s not exactly a negative against the machine. The Lord of the Rings has solid gameplay – it’s just nothing spectacular. On the other hand, the visuals, sounds and overall feel of the game make it extremely fun and entertaining to play. 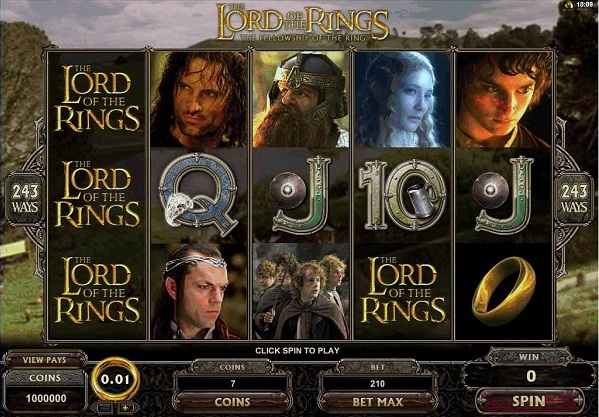 If you’re looking to have a good time the next time you play a slot machine, give The Lord of the Rings a chance – and if you’re a fan of the films, there’s no excuse not to play this game. Taking its inspiration from the gem bursting games now so popular on mobile and social apps, Starburst is a mobile slot any gamer will quickly recognise. Whilst disappointing some critics when this game first came out online, this Starburst slot never disappointed us and has now becomes a highly acclaimed slot game. The theme is brilliant, and by that we mean it in the literal sense, as it’s a simply “very bright and radiant” game. The colors jump out of your screen and jingle and disappear in a haze of sound. See? It’s even made us slightly poetic. 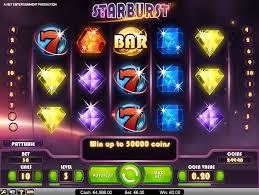 But true to it’s origin, Starburst online slot seems fit for mobile. Whilst it was a decent play online, it’s only since it’s made it’s jump to the mobile screen that it has become one of our firm favorites. Not only does it provide you with fantastic graphics and sounds, but as with all NetEnt Touch games, the controls make it incredibly easy to play. At first glance, people might get disappointed at the fact that this mobile slot game has only one bonus feature, but the original gem bursting games are popular because of their simplicity – and in this case, less is definitely more. Obviously this Starburst slot review is based on our personal taste, so if you prefer something with constant surprises, you might want to look elsewhere such as the bonus feature heavy South Park slot by the same provider. However bear in mind that Starburst is a two-way-win mobile slot, meaning it awards a decent number of prizes and as a mid variance slot, not only does it pay out often enough, but the wins can be very impressive. These are 10 paylines that will leave your wallet cosmically happy. Starburst Wild: A wild Starburst symbol appearing on reel 2, 3 or 4 will substitute all the icons on that reel and trigger a re-spin. The maximum amount of re-spins you can get from this is 3. Despite the lack of bonus features, Starburst’s fun design and great sound track quickly makes this mobile slot game a firm favorite with us. The fact that it has two-way-wins and a decent in-game slot jackpot probably helps. Give this game a try! Play it here! The jackpot currently stands at over 10 million. It’s the highest it’s ever been and it’s ready to burst! Star playing, don’t miss out. So the jackpots. You want to hear about the jackpots. And the progressive jackpots on this video slot (5 reel, 25 payline) has four of them; Mini, Minor, Major and Mega. Free Spins: Get 3 or more wise fortune telling monkeys to activate 15 free spins during which all wins are tripled. If you don’t win the jackpot, these free spins are where you’ll get nice top ups to your bank account in order to keep on playing. 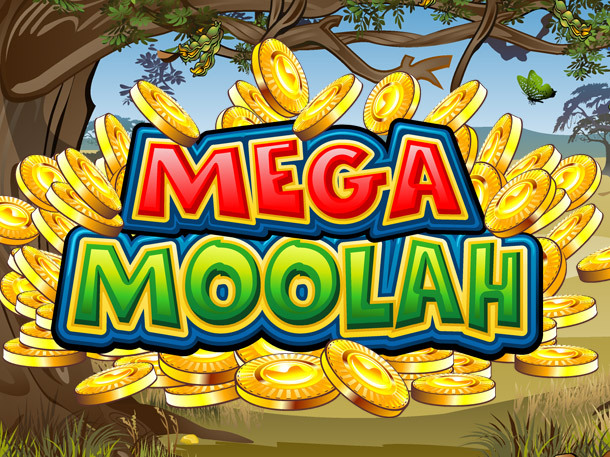 We give Mega Moolah slot a five star review, a mobile jackpot slot that has everything you need. 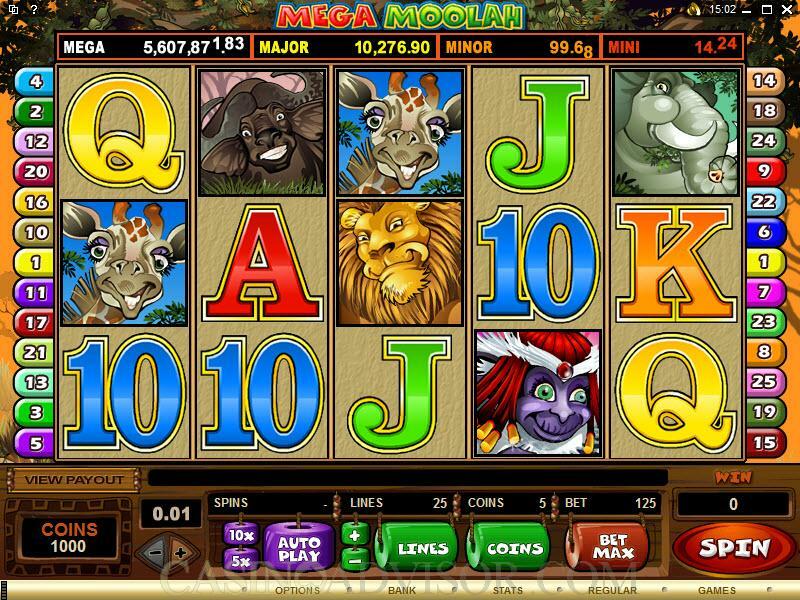 Wilds, scatters, free spins, jackpots galore and a great fun theme to boot. There is a reason why this is one of the all time favorite Microgaming slots for so many. Not only does it give you hope for millions in cash, but with a low volatility it gives you enough small wins throughout the game to help keep you playing for as long as possible. If you fancy something a little darker in theme, and don’t mind playing on Android phones or as an online slot The Dark Knight Rises is in the same jackpot pool. Wilds: That speedboat is a blessing. Racing across the screen, sending ocean spray across the reels, it’s a simple little graphic that makes winning using it as a combination all the more exciting. The reason why we love this symbol so, is that not only does it replace all the other symbols (except bonus and scatter) but it comes with a 5x multiplier, meaning this symbol is the easiest and best way you’ll recoup your bets and keep playing. Scatter and Free Spins: Get three or more Champagne symbols (scatter) on the 5 reels and you’ll activate a click me feature where you’ll get a random number of free spins with multipliers. Usually the more free spins you get, the lower the multiplier and vice versa. The more scatters on the screen, the higher the potential multipliers. We found that on 3 scatters, we came out of the free spins game with about 10x to 14x our bet. On four scatters, you get a more generous payout of about 20x your bet. On five scatters… well this is almost like hitting the jackpot, and although they do say you can get up to 100x your bet, the time we got it, we walked out with a more conservative 40x our bet. Great sub-feature of this is that if you get two scatters or more during the free spins rounds, you’ll get to pick again and gain additional spins and multiplier. A feature you hit on almost every free spin. 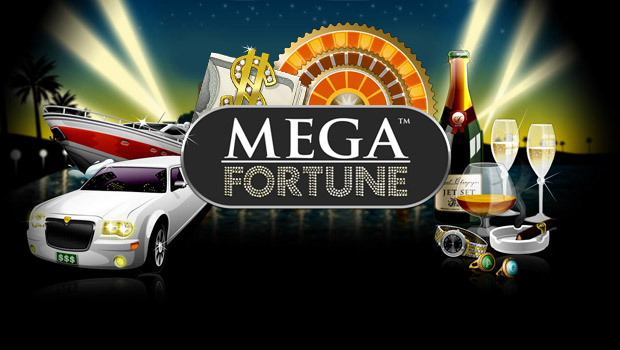 Mega Fortune mobile jackpot slot is a fairly standard slot machine. It has free spins that don’t hit incredibly hard, but they come around often enough that you don’t mind so much. You will be dependent on the wilds and that 5x multipliers to get you any decent wins on the board, but again, this symbol is so frequent on the screens, you’ll be happy either way. At it’s core it’s a simple, fun, entertaining mobile slot. The fact that it works flawlessly on all devices, despite NetEnt’s warning, makes it at least a four star slot. But it’s that Mega Fortune bonus game and that mega jackpot that makes it above average in every way and shoot straight to the top of our mobile slots list with five stars. There are not many slots that promise you millions in riches, and even fewer who do it whilst still making big winners of a few thousand. Mega Fortune Touch walks the line between the two perfectly. We recommend it whole heartedly! The second of IGT’s 1024 ways to win mobile casino slots, this Crown of Egypt slot is as much fun as it’s big Greek sister, Treasures of Troy. Sometimes we wish we could understand IGT’s logic. They give us the mediocre looking mobile slots like Da Vinci’s Diamonds and Kitty Glitter, great mechanics but hope we don’t notice how ugly they look on a screen larger than your thumb, and then we get Crown of Egypt mobile slot. Which is so beautiful we could cry. 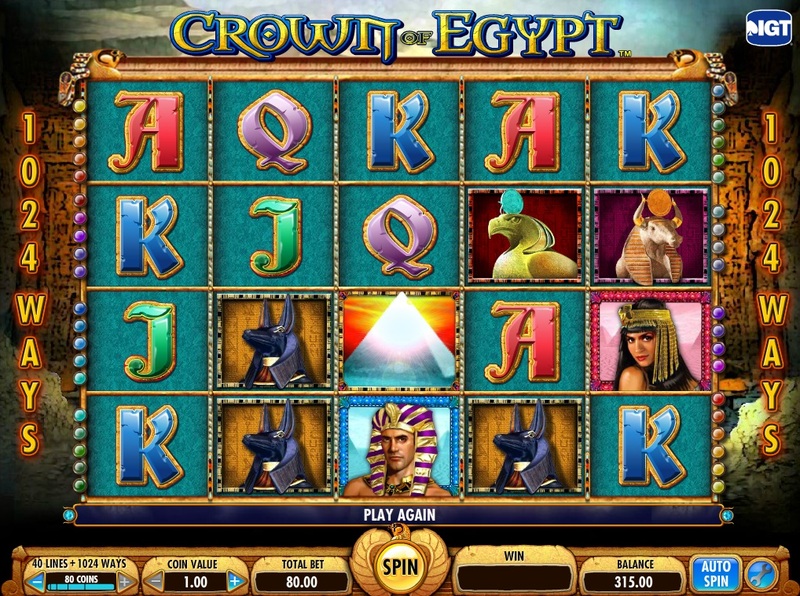 Ok perhaps we are exaggerating a little, but this is one gorgeous looking mobile video slot, with realistic characters in the Pharaohs and Egyptian gods littering the 5×4 reels. Yeap, 5×4; leading to the 1024 multi-ways to win we mentioned earlier. It not only looks good, but Crown of Egypt slot game plays incredibly well, fast, and with interesting graphics flashing on the screen with every win. The sounds are your fairly standard “I think that’s an Egyptian flute/ drum/ maracas” that is expected for any Egyptian themed casino slot, so nothing incredibly exciting, but reassuringly familiar. The Multi-Way win is the real draw for this casino game, let’s be honest. Working more or less the same way as Treasures of Troy mobile slot, you’ll have to read through our explanation in the features below if you really want to know the details, but essentially, your whole reels could be covered head to toe with symbols for big wins. Because in fact we get some of our bigger wins through the main game feature than we do on the elusive Free Spins bonus feature, due exactly to the multi-way. But that’s ok because the MultiWay is the star of the show anyway, causing this low/medium volatility mobile slot to give you far bigger wins than expected. Sure, these only tend to be about 50x your bet, but with a few lucky spins you could find yourself way ahead of the rest. 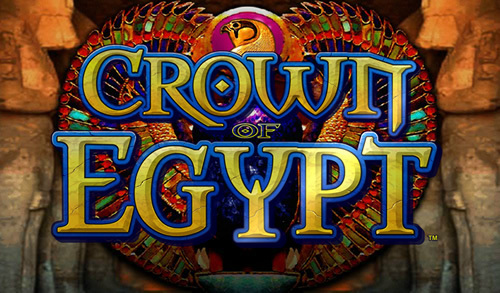 Ultimately, Crown of Egypt online slot is not for the faint of heart – you’ll have to be willing to be in for the long term to win big and there is no guarantee you’ll come up on top. In short, watch your budget careful, and try and stay in the game for at least a minimum of 200 spins. You may be lucky early on, but if your not, you could be waiting for the Egyptian empire to return. MultiWay Xtra Pays: Don’t despair when you first read this feature. It looks devilish, and it is, but it’s in your favour. Basically the paylines are not just left to right, but also up and down the reel columns themselves. You need only the same symbol to appear on four or five columns, anywhere on the columns, to get a multi-way payline. You then have to count each of the symbols on each of the columns and multiply them together. So if you get 2 Jacks in column 1, 1 Jack in column 2, 3 Jacks in column 3 and 2 Jacks in column 4… you’ll get 2x1x3x2 = 12. As the Jack has a value of ’10x’, you then times 12×10 giving you a win of… 120 coins. The games will do it for you, so clearly you don’t need to figure out the maths, but its good to understand the idea behind the MultiWay approach as this is the feature that will hit the more frequently and get you the big wins. Free Spins Bonus: Get two or more Bonus symbols on any of the centre columns and you’ll get free spins. 2 bonus symbols gets you 10 free spins, 3 will get you 15 free spins and 4 will get you 20 free spins. These can be re-triggered, but we’ve never encountered it, so it’s not incredibly likely to happen. Theoretically (ie. shuffling a pack of cards and getting it back in order by suit and numbers theoretically) you can get up to 130 free spins in re-triggers. With the multiway win there is no additional multiplier, although technically you could consider any of the characters to be multipliers, up to a massive 500x (but more likely 10x or at best 40x your bet). For all player types who want an action packed time, Crown of Egypt mobile slot is an excellent choice. Low to medium volatility with a 95.03% payout rate, you have to be a little careful with your budget to ensure you can keep playing to hit the big Multi-Way Extra Wins on offer, but when you do it can be worthwhile. Similar in mechanics to Treasures of Troy, if you like the Roman themed mobile slot and looking to go further afield in the ancient civilisations, why not Egypt? It is by far one of the best IGT mobile slots on offer today. 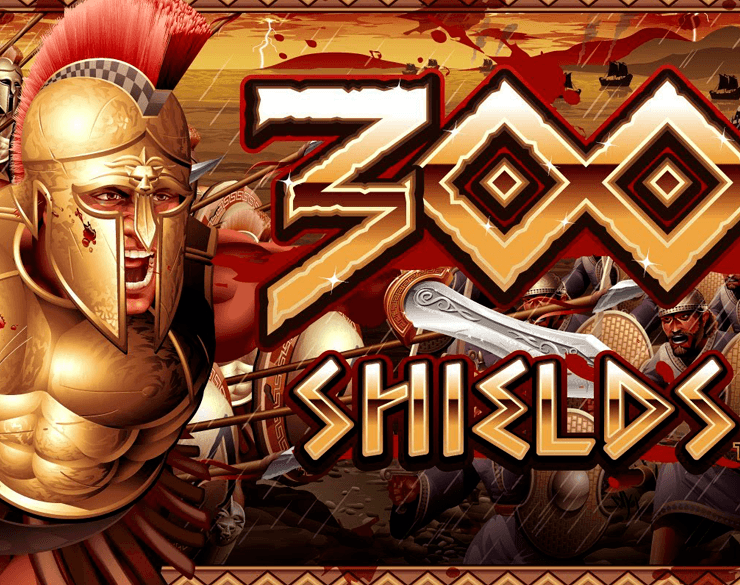 Scatters & Free Spins: Get three shield scatters anywhere on the reels and let the battle begin! This is thrilling stuff, where you’ll only get 5 free spins with a 2x multiplier to begin with. You’ll then need shields to get more free spins and bigger multipliers. Stage 3: Another 5 free spins awarded, this time with a 25x multiplier on the wild symbol. You’ll need to collect an improbable, but possible, 12 shields to move on to stage 4. Stage 4: The goal of this entire game. You’ll get 5 free spins where all your wins made using the wild symbol pay out an incredible 300 times your bet. If you reach this point you’ll be in the middle of such a beserk battle frenzy we doubt anyone will be able to remove you from your tablet. All very impressive, but we won’t lie, 97% of the time you won’t get past stage 2. Still, even this stage is impressive enough that it’s worth dreaming a little dream of battle. 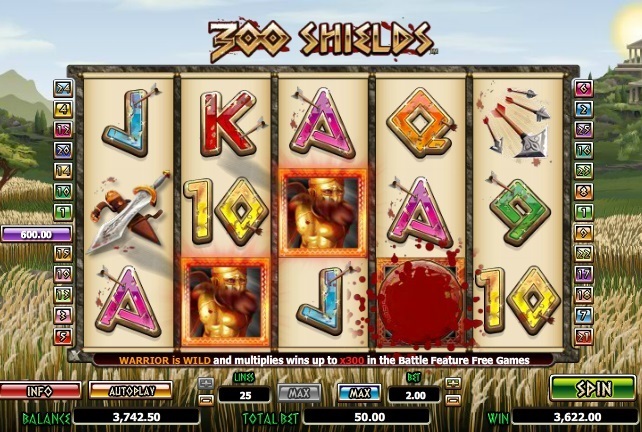 A very simple risky slot that needs little introduction 300 Shields mobile slot by NextGen has a loyal band of followers who will always be happy to head into this gold filled battle. It’s by far one of the most popular games of it’s kind, followed closely by Medusa. 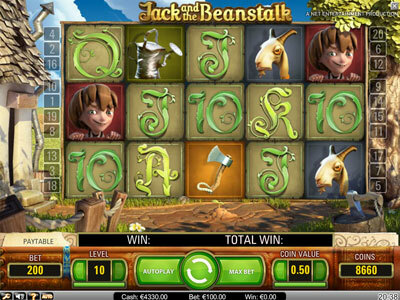 We don’t think that Jack and the Beanstalk mobile slot by NetEnt needs any introductions. First released online in late 2011, it’s been a firm favourite with many, continuing to enchant players hearts years after it’s release. And shame on us. It took little to no time for the glee in our face to rediscover one of the true classic gems in the NetEnt slots portofolio. There’s no way to hide it, Jack & The Beanstalk video slot is all about the free spins. And when you get them, mostly you’ll walk away with an average of 30x your bet, with big wins going around the 50x mark. Net Entertainment has once again created a video slot with ground breaking graphics and design. Even though Neon Staxx is a new slot, it still brings you back in time with its cool retro look. The game is slightly tilted backwards and makes it feel like you’re playing on an old arcade-style game. The name might give this part away, but the game is absolutely packed with neon colours, along with some funky vibes and an atmospheric soundtrack with some sweet synthesizer tunes. Neon Staxx is a video slot with five reels, four rows and 243 ways to win. Winning combinations are formed by matching symbols on a win line from utmost left to the right. 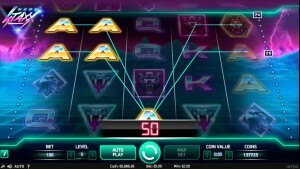 Special game features of Neon Staxx includes symbol-substituting Wilds, Stacked Symbols, Free Spin Feature and the new SuperStaxx feature. If you have been able to get three, four or five Scatter symbols on the reels, you will be awarded respectively 10, 15 or 20 Free Spins. Before entering the Free Spin feature you will have a Super Stacked symbol be chosen at random, only the Predator symbols (higher pay-out symbols) or the Wild symbol can be awarded as the stacked symbol for the entire Free Spins round. As usual, the Wild will substitute all the other symbols (except for Scatters) that you might need to get a winning combination. This gives you the chance to get some big wins. The new SuperStaxx feature activates randomly and turns a whole reel into the same symbol. The feature can appear on any of the reels at any given moment. This feature can become even more interesting since several reels could possibly be affected and turned into the same symbol. If you are very lucky, even all of the reels can become the same symbol. Play this awesome game here!